Published March 21, 2019 at 12:01 p.m. While sleep is the most important part of a bedroom oasis (read our recent Steinhafels blog for World Sleep Day), many people also like to spend some of their awake hours in their bedroom. A bedroom oasis can be used for reading, writing, crafting, watching TV – anything that helps you feel relaxed and at ease. 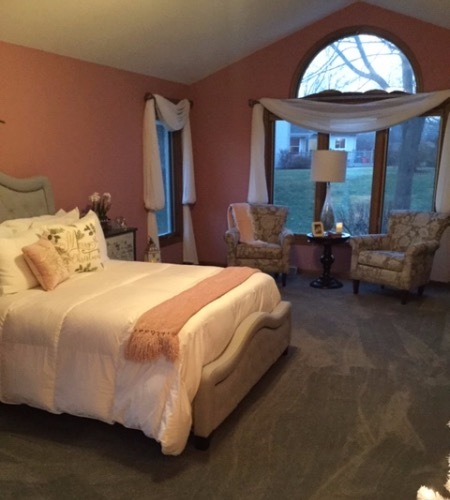 Today, we talk to Steinhafels Decorating Solutions Interior Designer Lori Green about a recent project that included a bedroom redesign. Lori is based at our Greenfield store in the 84 South shopping complex. She explains, "A bedroom redesign is very personal, from selecting the comfort and support of the mattress, to finding all the right size furniture and coordinating colors for that comfortable space." 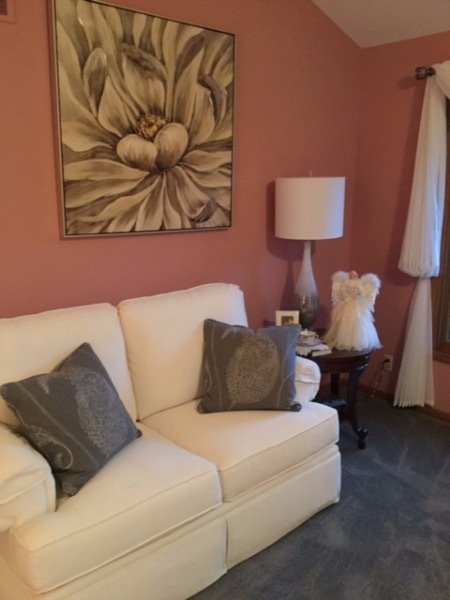 This design client chose a beautiful coral pink color on the walls. We selected a comfortable mattress with an upholstered bed. It has multiple functions with the adjustable base. From paint to window treatments, our Decorating Solutions team can consult on every aspect of interior design. In this case, you probably noticed the bold paint color. 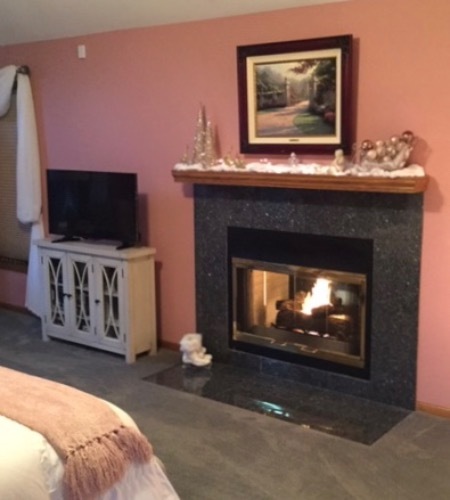 Lori says coral pink was the client's first choice, and she enjoyed working with this deep, rich color. "We went bold and beautiful for her space, and with that first step, we then selected the upholstered bed. The bed is fashionable and comfortable. The fabric is light gray, complemented by nailhead trim and buttons – such a beautiful style." The room is very spacious. For the windows, we added blinds for privacy and the silk drapes to give a soft white framing to the windows. Obviously a bedroom oasis needs to have a fabulous mattress and sleep system! Lori decided to go with a Tempur-Pedic. "We also selected an adjustable base with unlimited range of positions. The Tempur mattress is supportive, and has cooling technologies to help you sleep comfortably and undisturbed through the night." Adding some seating in a bedroom is another way to make it a relaxing space. In this case, the client is lucky to have a large bedroom. 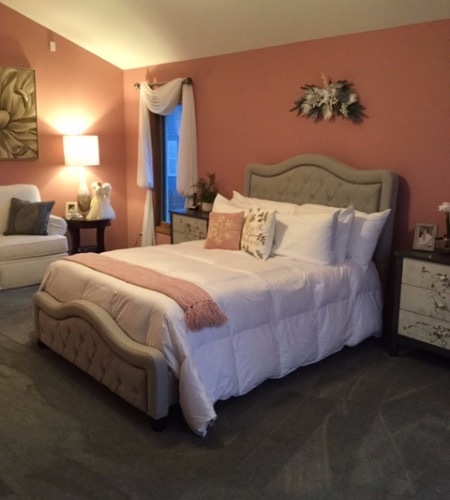 Lori recalls, "Making the room bright and light was a must for this client, so selecting the gray upholstered bed was a wonderful choice. The correlating chair fabric in a soft gray floral print was perfect for a sitting area and TV viewing space. The white silk window treatments were chosen by her for a dramatic look and blinds for privacy. The accent chests are stylish storage. We blended creativity and function by using these three-drawer chest for nightstands. On the opposite end of the room is another relaxing spot, with a white linen loveseat to read and stretch out in. I added classic end tables for a timeless look, and the lamps having a charming appeal, plus the floral oil painting was perfect for the wall." She can have a restful night and watch TV, as well as view the lovely fire while relaxing in two different sitting areas. We added a painted console to hold the TV. Even if your bedroom is small, you can add variations on these calming touches to give your bedroom a more intimate, personal feel. A designer often forms a special bond with a client. This instance is no different. "Working with this design client was a joy," Lori exclaims. "We worked in this room, and other areas of the home as well, and to see it all come together the way the client envisioned was so exciting! That was my favorite thing about this project. It's all about them." She adds, "The best thing about finishing a project is seeing the excitement in their face. When they are pleased, there is nothing that makes me happier with my work than that." Let one of our Steinhafels Decorating Solutions interior designs help you create a bedroom oasis. Stop into your local Steinhafels Superstore – we're here to help you live and sleep better!